Golden Phoenix Hotel Manila is situated in Sunrise Drive of Central Business Park in Macapagal Boulevard, Pasay City. I really wouldn’t know where it’s located until they pointed out to me the familiar landmarks: it’s at the back of the Sea Residences and just walking distance to the Mall of Asia Arena. Anyhow, just look for this structure with touches of gray and yellow. It’s actually called the Oceanaire Building and is also home to a condominium complex. The spacious marble lobby with the grand chandelier immediately impresses visitors. Took these photos of the receptionists while they were on break from their duties. Check in was a breeze since the hotel isn’t so busy yet. But certainly not for long! We were served Continental food … simple but delicious.Can’t wait for the opening of the hotel’s Gold Spices restaurant which will offer a wide array of Asian and international dishes on an expansive 400 square meter space. At this point, you might be curious about how the rooms looked like. Fret not. I can only say it was really Comfy (with a capital C)!!! This is their Deluxe Twin Room. I must say I really enjoyed sleeping here. They’ve got these uber-fluffy pillows and their bed is proudly chiropractic, the type which will not not give you any back problems. There was also an iPod dock and rainshower in the toilet area. Rooms at Golden Phoenix have the usual amenities like complimentary bottled water, coffee/tea maker, safe, hair dryer, bathrobes, slippers and a 40-inch LED TV with cable. Special online rate for the deluxe twin room at Golden Phoenix is only P5,000 net if booked directly through the hotel website. If with buffet breakfast, rate is at P5,500.00 and this is already inclusive of free wifi and parking too. 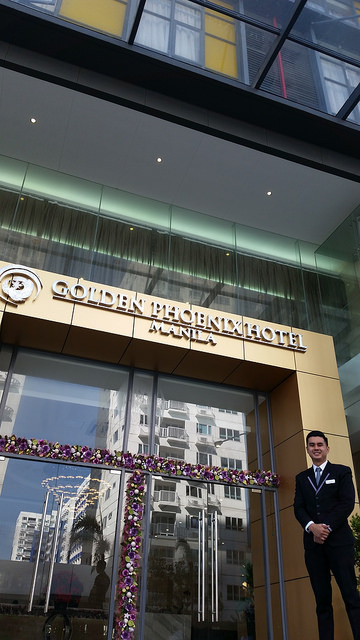 The other room categories at Golden Phoenix Hotel Manila are the Superior (P4,000 per night), Deluxe King (same rate as Deluxe Twin) and the Suite – with living and dining area, 40 square meters in total – where the best available rate is approximately P8,500. P1,000 worth of items in the mini bar! Too good to resist! So yes, am thinking of billeting the family at this hotel for the coming long vacation. The plus of this hotel is its accessibility to the Mall of Asia which is one of the kids’ favorite places to hang out in. It’s near MOA but at the same time it’s in a very quiet area, away from the noise of buses and jeepneys. I took a walk around the vicinity and hotel guests are just a stone’s throw away from a number of restaurants, cafes and convenience stores in the adjoining Sea Residences Condo.